The Winter Triangle, or the Great Southern Triangle, is an asterism formed by three bright stars in three prominent winter constellations. These stars are Betelgeuse in Orion, Procyon in Canis Minor and Sirius in Canis Major constellation. The Winter Triangle is prominent in the night sky in the northern hemisphere during the winter months, from December to March. The winter asterism is considerably smaller than the Summer Triangle, formed by the prominent summer stars Vega, Altair and Deneb, and dwarfed by the larger Winter Hexagon, also known as the Winter Circle, which dominates this region of the sky in the winter. The Winter Triangle is approximately equilateral and shares two vertices – the stars Sirius and Procyon – with the Winter Hexagon. Betelgeuse lies at the centre of the Winter Circle, roughly between Procyon and Aldebaran, but is not part of the larger asterism. The three stars that form the Winter Triangle are among the brightest stars seen from Earth. With a visual magnitude of -1.46, Sirius is the brightest star in the sky, almost twice as bright as Canopus in Carina constellation, the second brightest star. Sirius is in fact a binary star system consisting of Sirius A, a bright white main sequence star belonging to the spectral class A1V, and Sirius B, a faint white dwarf of spectral type DA2. The distance between the two components varies between 8.2 and 31.5 astronomical units. Sirius appears so bright partly because it is one of the nearest bright stars to Earth. At a distance of only 8.6 light years, it is the 7th nearest star system to our solar system. Procyon, the eighth brightest star in the sky, has an apparent magnitude of 0.34 and is also one of our close neighbours – the 16th nearest star system to Earth – at a distance of only 11.4 light years. Procyon is also classified as a binary star. It consists of Procyon A, a white main sequence star of spectral type F5 IV-V, and Procyon B, a white dwarf belonging to the spectral class DQZ. The name Procyon comes from the ancient Greek Προκύων, which means “before the dog,” referring to the fact that it rises just before the Dog Star (Sirius). The three stars of the Winter Triangle are easy to find because they lie in the vicinity of Orion’s Belt, one of the best known asterisms in the sky. Betelgeuse, the left shoulder of Orion, is the bright red star above Alnitak, the easternmost star of the Belt. Sirius can be found by following the line formed by the Belt stars to the southeast, while Procyon lies to the upper left of Sirius. 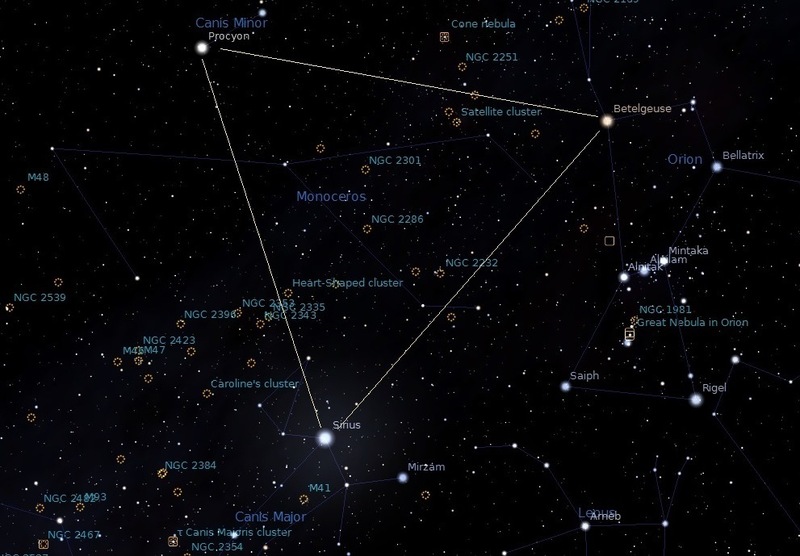 The Winter Triangle is useful for finding the winter portion of the Milky Way in the sky. On a clear night, a band of our galaxy is visible just to the left of Betelgeuse and Sirius, and right of Procyon. It extends to the northwestern sky through the larger Winter Hexagon, between the bright stars Aldebaran in Taurus and Capella in Auriga. 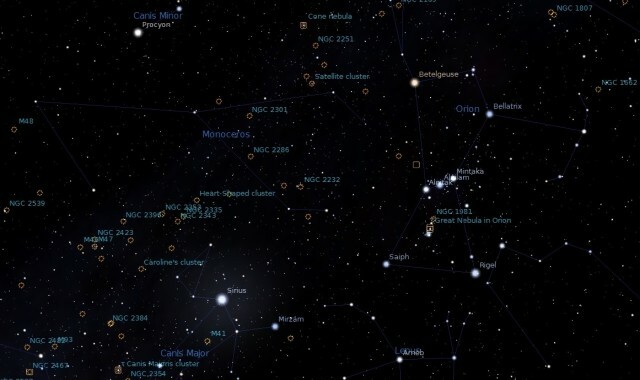 The asterism can also be used to find a number of notable deep sky objects that lie in this region in the sky. These include the Heart-Shaped Cluster (Messier 50) and the Cone Nebula with the Christmas Tree Cluster (NGC 2264) in Monoceros constellation, Messier 41, the Tau Canis Majoris Cluster (NGC 2362) and Caroline’s Cluster (NGC 2360) in Canis Major, and open clusters Messier 46, Messier 47 and Messier 93 in Puppis constellation, and Messier 48 in Hydra.